Apple has proven itself to be quite the industry disruptor. Just look at the phone market; the introduction of the tablet and its inroads into the music industry with iTunes, with rumours of its entry into the payments market having been long expected. With the announcement of Apple Pay recently, we could be on the verge of seismic change for the digital payments sector. Whenever a new player enters the market, there's speculation about the impact they could have. History suggests that Apple has the foundations and business strategy to give the entire industry a shot in the arm. Thanks to its iTunes account, the California-based company already has access to over 500 million credit card details. In addition, the introduction of iBeacon technology to the retail sector means the environment exists for this next wave of digital payments to flourish. For years there has been debate about the practicalities of NFC technology. Many argue how useful it is and when it will, or if indeed it can, capture the imagination of consumers. However, the staying power it has shown may well be the best evidence that it is a technology waiting to explode in popularity. With Apple finally using NFC technology in their new iPhones, we may be close to the tipping point needed for NFC to really take off. The company's ability to introduce new concepts to the mainstream means it could act as a vanguard for mobile payments. Helping consumers to pay for goods easily, offering loyalty bonuses and coupon solutions and also keeping merchants happy with valuable data to improve their offers. Crucially for Apple Pay, the service will support credit and debit cards on the payment networks of Visa, MasterCard and American Express. These represent nearly 83% of the total credit card purchase volume in the United States. Having access to these railroads of the payment market will mean Apple Pay has the greatest possible chance of reaching a larger customer base. Despite a lot of ground work being in place, it would be foolish to predict a flawless roll out and mass acceptance overnight. There are always going to be stumbling blocks and the biggest issue the tech giant now faces is that of availability. To start with, not every retailer has NFC capability in their stores and for those that don't, the focus will most certainly be on costs. Implementing NFC into their stores, training staff and consumers how to use it, all adds up. Then there's the issue that only iPhone 6 owners will be able to use the technology, meaning a large chunk of Apple's customer base could be left unable to use the service. It will take time for them to graduate onto NFC-enabled handsets. It's clear the technology and potential is in place for both consumers and retailers to take advantage of the ease and convenience that Apple Pay promises. 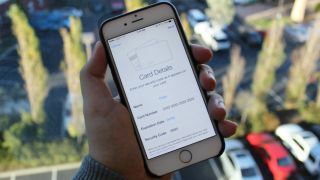 Apple's move into the payments industry will further enhance the profile of the industry and ensures digital payments remains at the forefront of consumers' minds as online shopping and buying behaviours continue to change. Mark Carter is VP Mobile at global e-commerce business, Skrill.